Published Bestsellers: "A beautiful tale shot through with humour that can be read many times"
spend Christmas with her family’s cleaning lady. She is worried about her mother, her father stranded at New York airport, hostility from the cleaner’s son and the unfamiliarity of the home she is staying in. But as with the first story, imagination runs riot, or is it reality and does it matter? A beautiful tale shot through with humour that can be read many times. As a Christmas story book I think it will work for a younger child and be read many times by an older child, a super book that is to be highly recommended." "This book of 3 short stories conveys the warmth and happiness of Christmas. In Not Without a Carrot, Trouble’s stubbornness as a donkey and liking for carrots is superseded only by his love of baby Jesus. 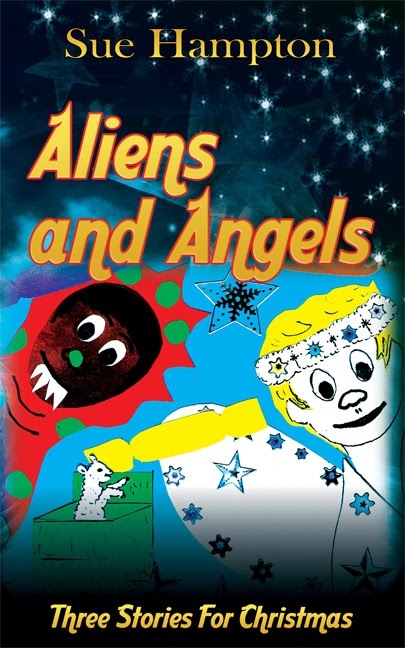 The other 2 stories have more magical themes: Aliens and Angels provides a mysterious angelic twist to the school nativity play; whilst in Bootee for Etta recipients of the 3 magical gifts convey a message of hope and happiness overcoming loneliness and despair. The stories can be enjoyed both for their simplicity, and also, by older children, for their underlying messages. Sue Hampton, teacher and author of several children’s books, aims to write stories full of love, understanding and forgiveness. This book, illustrated by children from primary schools in Berkhamsted, will appeal to younger children of various ages, whilst also being enjoyed by adults. By illustrating the effect of hope and challenge, with the help of a little magic, in overcoming adversity, these stories offer a valuable, and unique, addition to children’s Christmas literature." "Best Christmas book of the year! My favourite author Sue Hampton has come up with a cracker of a book this festive season. 'Angels and Aliens' is a book of three short illustrated stories for children. In the first story Robbie has to deal with not getting the part he most identifies with in the school play. Sue's simple language enables us all to empathise with his initial excitement and subsequent disappointment. Luckily with the help of his friends and a little celestial intervention, he is finally able to shine. 'Not without a carrot' is the second story and my favourite, due in part by the wonderful illustrations done by young children. A unique take on the traditional nativity story, Trouble the donkey is irresistibly stubborn, but proves in the end to have a soft and gentle heart. The final story deals with a young girl, forced to spend Christmas in unfamiliar surroundings whilst her mother lies ill in hospital. Worried and alone, a Christmas miracle finally leads to a happy ending that did make me cry a little bit. Buy this for your children, or even just yourself. You won't be disappointed!" "All three stories are charming... inspirational and spiritual in quite a subtle and lovely way." "These quirky tales, vividly told, will appeal to adults as well as children. Ideal for reading aloud at bedtime on Christmas Eve. "All three stories are original and imaginative and Sue’s writing brings them magically to life. Children will love these stories which will fire their imagination and make them laugh and smile." "I loved this book and have bought it as a present for a grandchild. In the first story Robbie did not want to be an alien as most little boys would love to be, he wanted to be an angel and dance, he wanted to be different. The second story, about Trouble the donkey, describes his feelings about the birth of the baby Jesus. Even the most obstinate difficult donkey has a soft spot! I particularly loved the last story. I am sure all children will identify with poor Etta and realise that they are very lucky if they have everyone they love around them at Christmas. However it all comes right for her in the end." "As a retired primary school teacher and author of children's stories, I thoroughly enjoyed this anthology of three Christmas stories. Aliens and Angels provided some beautiful imagery and a lesson in escaping from people's expectations, none of us should stereotype anyone! Not Without A Carrot stars Trouble the donkey and is told from her viewpoint, her name describes her character! A wonderful twist to a traditional story, which children will love. Bootee for Etta illustrates the important things in life and the differences between those that 'have' and those that don't. Very enjoyable and satisfying read with well rounded characters for a short story. I would recommend this book as an excellent Christmas read with some delightful illustrations from schoolchildren."